Tesla's new Powerwall battery offers an individual solution to the collective problem of climate change. Last month, Tesla Motors — an American car and technology company — announced its “Powerwall” to much acclaim. Headlines like “The Tesla battery heralds the beginning of the end for fossil fuels,” and “How Tesla’s Powerwall Will Shift Control to the Consumer,” are everywhere. Tesla promises the “game changing” home battery will liberate millions of consumers from the tyranny of the electricity grid by bringing power generation to the home itself. The battery-wall can be a mechanism to store solar energy — households would have to install solar panels on their homes that charge the battery (alternatively, one could simply charge the battery through the standard grid). In theory, this will free individuals from not only fossil fuels, but also from the geography of centralized power plant generators (nuclear or, coal-fired power plants), and dispersed networks of transmission lines. No more fossil fuels, no more electric utility bills. Maximum freedom. The ability of these batteries to truly run off solar is contested, but there is a bigger problem with the Powerwall than whether it will actually work. In privatizing and isolating electric power generation to the level of the household Tesla individualizes the collective problem of transforming our energy system. It reproduces the neoliberal logic that social change can be achieved through the power, and buying decisions, of dispersed, individual consumers. Powerwall is like the automobile of electricity. In the early twentieth century, American cities, large and small, were criss-crossed by a web of public transit — streetcars and nascent subway systems connected diverse and vibrant communities to each other and the public goods cities offered. A mixture of racist housing policies, deliberate corporate destruction of electric public transit, and federal road building ravaged this urban geography. In its place a sprawling suburban geography of privatized suburban homes and automobile transport emerged. A collective, public system — transportation — was privatized and, except for large metropolises, replaced by automobiles. Setting aside the profound social and political impacts of suburbanization (on both urban and rural areas), individualized transport systems have proven incredibly wasteful. From oil extraction to automobile combustion, this system encourages millions of private producers and consumers to engage in a massive externalization of environmental costs onto the public. Tesla is proposing a similar transformation — the privatization of electricity generation. The desire to solve the climate crisis and reduce our reliance on fossil fuels is powerful. But this shouldn’t blind us to the deep problems of a solution like the Powerwall. The likely exploitative and destructive geographies of extraction and labor required to give millions of consumers wall-sized batteries alone are enough to negate the ecological benefits. Equally important, what happens to the millions of people who cannot afford the “cheap” $3,500 Powerwall (not to mention the solar panels needed to get individuals off the grid)? In a city like mine (Syracuse, NY), people without access to an automobile are forced to rely upon an underinvested and decrepit public bus system. In a future where households are powered by individual battery walls, will poor communities who can’t afford them be stuck with an outmoded and underinvested grid? The electricity grid is a profoundly collective infrastructure. The very nature of the system requires that supply must always be calibrated to the fluctuating demands of society as a whole. New Deal dam building and rural electrification made the provision of electricity a public works program, and while many of the utilities that provide electricity have been privatized, they are still subject to some level of public (and democratic) regulation. No one is saying we should stick with the geography of coal- (or natural gas– or nuclear-) powered, centralized power generation. But nor should we abandon the idea that our electricity system should remain a shared public infrastructure. Electricity as a collective endeavor is already embodied in innovative projects to free society from fossil fuels — engineers are currently working on expanding “smart grids” that use centralized solar thermal power plants (like the ones in the Mojave Desert), and a dispersed geography of solar and wind generation that can complement each other when one region’s sun or wind is unavailable. And if the best way to solve the collective problem of climate change is to install solar panels on homes, household solar energy generation should be developed through a public works program that benefits the collective — not a commodity sold by a for-profit corporation like Tesla. The mass appeal of Tesla’s Powerwall in the US — they are already sold out until mid-2016 — demonstrates the widespread belief that “freedom” means privatized forms of control, that anything “centralized” is inherently exploitative and bureaucratic, and, most importantly, that environmental problems can be solved via a combination of entrepreneurial innovation (by corporations like Tesla, of course) and individual consumer decisions. We have seen how the privatization of energy systems produces profound social and ecological problems. The problem of energy and climate requires collective solutions that no single entrepreneur or consumer can solve on their own. 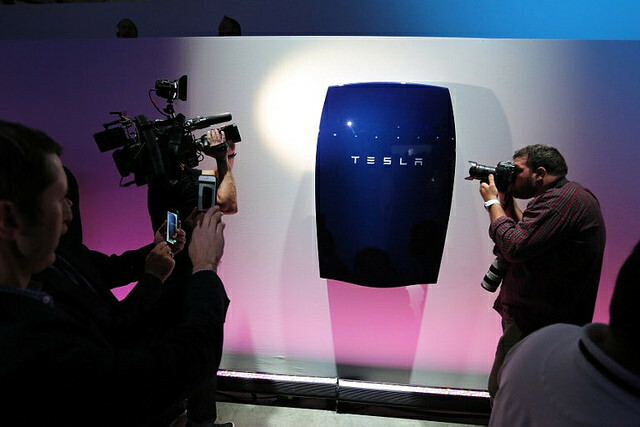 Tesla’s new Powerwall battery offers an individual solution to the collective problem of climate change.